Another proud moment for our establishment was to host the 1st ever Q Arabica Combo course in South Africa. And even prouder was to welcome the only Q Arabica Instructor in Africa, Mbula Musau of Utake Coffee (Kenya) to facilitate the course. 11 students from all over the country were in attendance. Comments like “mind-blowing” were heard in the halls as students were challenged by new techniques and I think they will all agree that this was the most intense, once in a lifetime WOW experience crammed into 6 days EVER!! Congratulations to Dirk Maritz of Famous Brands and Michael Mac Donald of Origin Roasting for obtaining this prestigious Q Grader title and well done to all attendees for taking this brave step and challenging themselves. Have a look at more pictures from the day on our Facebook Page! We will be releasing the next course dates soon, so watch this space. Our passion for coffee is expressed in our love of sharing knowledge. The Sevenoaks Coffee Lab is now an internationally registered and approved Q Graders Lab which means we are positioned to offer more advanced training to our clients and coffee lovers alike, who until now, would have needed to travel abroad for the prestigious Q Graders training opportunity. 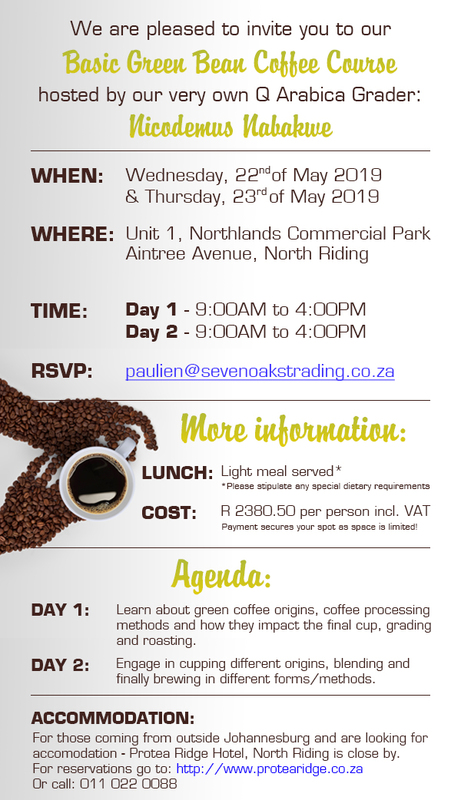 Keep an eye on our social media for upcoming training and events or send an email to coffee@sevenoakstrading.co.za to register.